Shamila Akhtar is one of the ten finalists in the instantprint Inspirational Business Awards, read more about her story and her business, InspirAbility in this interview. 1.) What has been the toughest part of setting up your business and getting to where you are now? During the InspirAbility journey I have overcome a lot of my own challenges – my lack of confidence and self-belief has held me back for years. Through setting up InspirAbility, I have managed to build up my own confidence as well as the confidence of others around me. My business is all about the people, and I’ve used this as a motivational factor to get me through the hard days. 2.) Why did you enter the inspirational business awards? I wanted to spread the word and show people living with disabilities that they’re not alone. Through confiding in other people it is possible to get a greater understanding of your own illness and how to cope through all conditions. 3.) What do you think makes your story so inspirational to other small business start-ups? And why do you think you deserve to win? Turning something negative into a huge positive and breaking down the barriers has helped me and others suffering with disabilities to transform their perspective on life. It’s taken a long time but I have completely embraced who I am and learned not to hide my illness from others. I have written a series of books designed to raise awareness of disabilities. The books are accessible in all kinds of formats, such as braille, large print, audiobook and e-book formats. The books have also been written for a Muslim audience to facilitate the lack of resources currently in that community. 4.) If you could give one piece of advice to small business start-ups, what would it be? If you really want to do it, don’t give up! Keep pushing through the lows to get the highs, you’ll seek the rewards in the end. Realise that you can achieve anything no matter the circumstances. 5.) If you win, what do you plan to do with the prize money and promotional products? I’ll be investing some money to further develop my website to spread the word of InspirAbility and help expand our support network. You have until Sunday 6th December to vote for Shamila & InspirAbility as Britain's Most Inspirational Business. 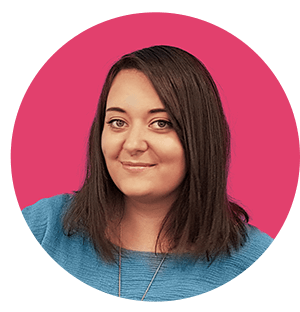 Hi, I’m Jessica and I’m instantprint’s Content Executive. I enjoy writing content to help small businesses succeed and inspire them to get creative with their print marketing.